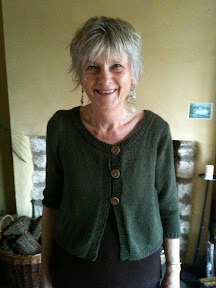 This is my mother-in-law in her birthday cardi. It's only 6 months late but then the cardi and I have fallen out quite badly on a couple of occasions during the design and make process. As you can see Jehanne's very pleased with it but not half as pleased as I am to have finally finished it!